HOLLYWOOD—It isn't every day that legends from two such disparate worlds share the stage. But it happened Friday night at the Hollywood Bowl. Composer John Williams, halfway through his annual concert with the Los Angeles Philharmonic, turned to the audience and talked briefly about a short film he scored earlier in the year: Dear Basketball, an animated adaptation of Los Angeles Lakers great Kobe Bryant's farewell poem to the sport he loves. And then he introduced his surprise guest, Bryant himself, who electrified the audience of nearly 17,000 by narrating his own poem while Williams conducted his original score to the film by longtime Disney animator Glen Keane. "I can't believe this is happening," Bryant said. The two embraced warmly after the five-minute performance, and he returned to the stage at the end of the concert to share the standing ovation with maestro Williams. 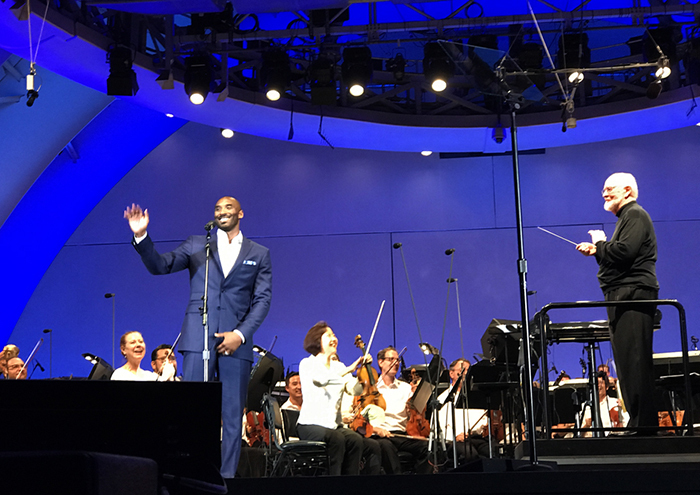 Bryant later Tweeted: "Never thought I'd be onstage w/ the great JOHN WILLIAMS @Hollywood Bowl to perform the Dear Basketball animated short. Thank u LA #mindblown." Williams, always a favorite with the Bowl crowd, gave the audience a laugh when he confessed that had "never seen a basketball game, in high school or college or professional" when Bryant called him a few years ago. Dear Basketball was just one of several musical highlights during Friday's concert. Williams also performed three pieces from the Harry Potter films ("Chamber of Secrets," "Aunt Marge's Waltz," "Harry's Wondrous World") and three more from the Star Wars series ("Scherzo for X Wings" and "Rey's Theme" from The Force Awakens and "Throne Room and Finale" from the first film). Thousands of red, green and blue light sabers glowed in the dark as the Philharmonic played this often virtuosic music with gusto. Well-chosen film excerpts accompanied both "Chamber of Secrets" and "Rey's Theme." Also on the program: "The Adventures of Mutt" from Indiana Jones and the Kingdom of the Crystal Skull, a virtuosic curtain-raiser for the second half of the program, and a suite from Williams' classic score for Close Encounters of the Third Kind, always a magical experience whenever he conducts it. Williams did no less than four encores, including his theme from Sabrina, with a gorgeous violin solo by Philharmonic concertmaster Bing Wang; the "Imperial March" from The Empire Strikes Back, which brought out more waving light sabers; and themes from Superman and E.T. 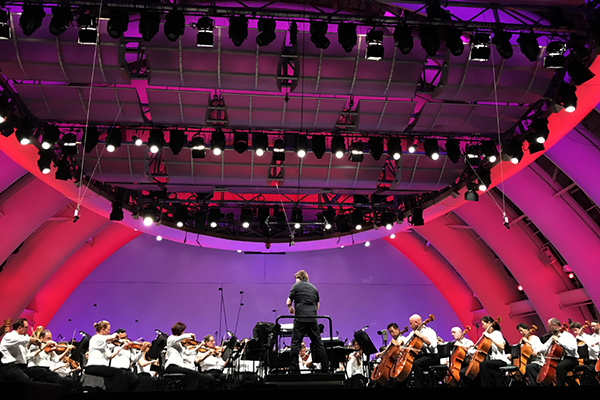 The first half of the program was conducted by veteran David Newman, of whom Williams spoke warmly ("he knows more about film music than anyone I know," Williams said). Newman kicked off the program with Erich Wolfgang Korngold's march from The Adventures of Robin Hood, and then spoke at length about the early days of music in Hollywood, when Austrians like Korngold and Max Steiner – as well as Newman's own father, the American-born Alfred Newman – developed "a completely new art form," scoring for film, "one of the great achievements of the 20th century." Highlights from that first half also included Bing Wang's violin solo on Alfred Newman's theme from Wuthering Heights, Williams' wildly romantic suite from the 1979 Dracula, a nicely compact suite from Maurice Jarre's Oscar-winning Doctor Zhivago score, and the "Born in a Trunk" sequence from A Star Is Born with Judy Garland's 1954 vocal performance matched by the Philharmonic's live playing. Newman and Williams repeated the program on Saturday and Sunday nights.